Whole Buddhist Duck There are 3 products. 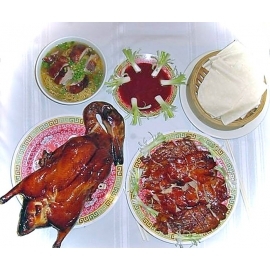 Our Buddhist Duck comes processed with the head and feet left on and a giblet pack. Antibiotic free and certified All-Natural. The net weight is at least 6 pounds. Shipped fresh on the day of harvest. Case of 6 Buddhist Ducklings, each processed with the head and feet left on and a giblet pack. Antibiotic free and certified All-Natural. The net weight is at least 36 pounds. Shipped fresh on the day of harvest. Case of 6 Buddhist Ducklings, each processed with the head and feet left on and a giblet pack. Antibiotic free and certified All-Natural. The net weight is at least 36 pounds. Shipped frozen.